"It would appear to be a class photo of my aunt, now dead, when she was at John Street Secondary. Presuming she was in her second year at secondary school, and 14 years old, it would have been taken in 1946. The names are on the reverse, and would appear to start from the top left. 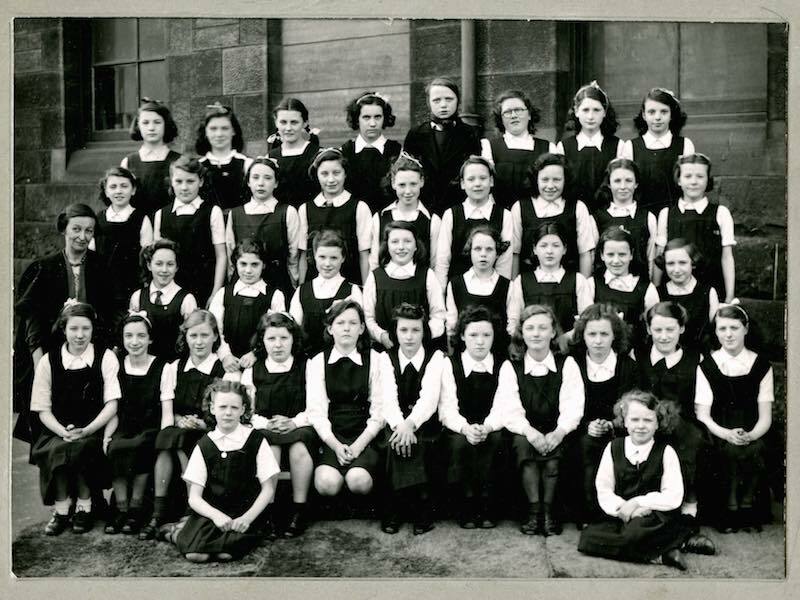 Teacher was known as "wee Jeanie" Shaw. Webmaister: Class 2c. A photo of Sally Hunt, 56 Dalmarnock Road, Bridgeton, Glasgow S.E. and her 37 girl classmates. John Street Senior Secondary School at second year put the children into certain classes. Class 2C was commercial and as you can see in those days was only girls. Class 2B was technical and was only boys.